Display your publishing accomplishment with pride. Proudly display your book award or memorialize the publication date of your book. 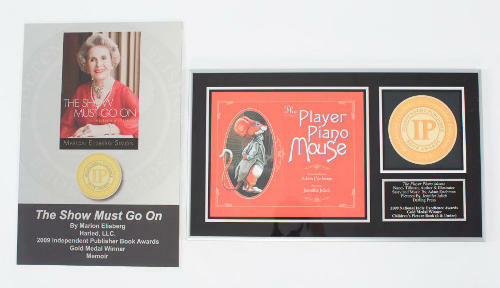 Jenkins Group has partnered with That s Great News and Signplicity to offer custom printed plaques to not only book award winners but all publishers. Proudly display your achievement with a beautiful, customized, easy to hang plaque. Your award plaque can be oriented to fit your book cover - portrait or landscape. We will match your cover size and orientation to the appropriate plaque size. A small sized book cover of 5"x7" will give you a plaque sized 8"x12". A medium sized book cover of 6"x9" will give you a plaque sized 9"x14". Lastly, a large sized book cover of 8.5"x11 will give you a plaque sized 11"x16". Jenkins Group is 100% committed to providing our clients with the most elegant, highest quality plaques and awards available anywhere. Once your plaque is purchased on this site, we will verify the order and send your a confirmation email. You will be provided a Jenkins Group Order Number along with a link to a special webpage or form. You will then complete the order by entering the text you would like on the plaque, selecting the medal you won and uploading your cover image. International shipping costs are additional - call for pricing.